I bought my Heptacodium jasminoides from the rose grower André Eve’s garden in Pithiviers-le-Vieil in September of 2007. It was not very big but the jasminoides part of the name and the mention that it was perfumed was enough to attract me and clinch the sale. Since then I have discovered that it originates from China and has only fairly recently become cultivated as a garden plant elsewhere. The Chinese name means “seven-son flower from Zhejiang”; I hope that sounds nicer in Chinese. It refers to the seven-flowered heads of the inflorescence according to the botanists but mine seems to have six little flowers around a centre that does not flower. This is more easily seen when they are still in bud as they get a bit difficult to count in a photograph when they are in flower. 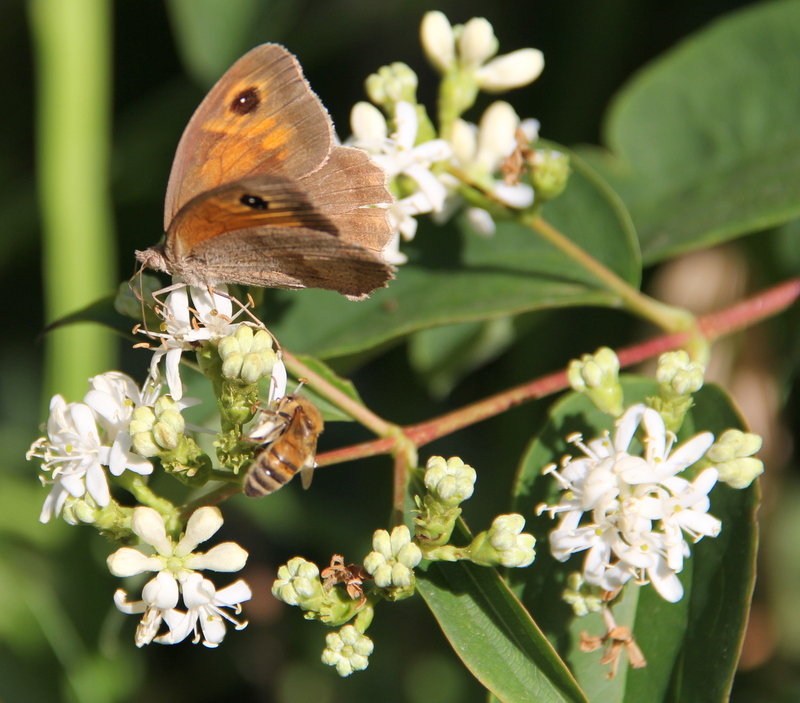 I haven’t found any other common name and I feel very pompous when people asked me what it is called and I have to say Heptacodium jasminoides. So I am proposing that it should be called the “Bumble Bee Tree”. From early morning the tree is covered in bumble bees, mostly the white-tailed variety (Bombus lucorum) but other bumble bees, honey bees, butterflies and other nectar feeders also visit. All the nectar feeders share the flowers with no aggression but a lot of careless flying and landing goes on, knocking each other off as one lands heavily on the same or nearby flower head. I do not understand why it is 95% white-tailed bumble bees that cover the blossoms. The other 5% consists of the other common bumble bees, such as the carders and red-tailed bumble bees, some solitary bees and honey bees. It perhaps is a good illustration that the bumble bees have their “favourite” nectar sources but are ready to compromise on an opportunistic basis. It is also interesting to find a plant that is definitely not native but proving to be a favourite food source for a native insect species. 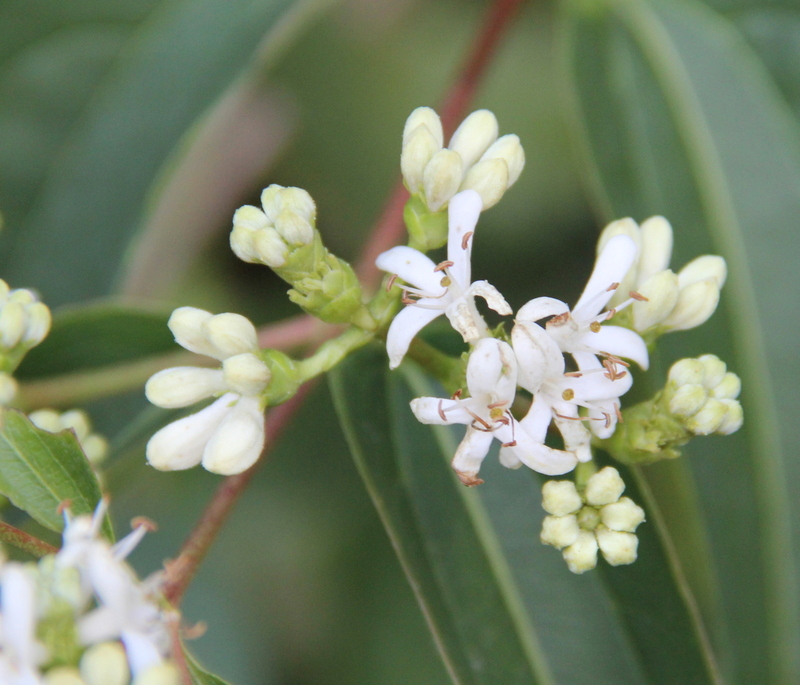 Perhaps the explanation is that the plant belongs to the genus Caprifoliaceae, which is the same family as Loncera, the honeysuckles. I have not found that it has grown rapidly in my garden, although it can grow to six or seven metres, but this may be due to soil and climate conditions. It must be relatively hardy, at least when it is established, as last February we had two weeks of sub zero weather with the lowest temperature reaching minus seventeen centigrade. I have never tried taking cuttings but I have read that it can be propagated by sowing the seeds, preferably in a warm greenhouse, or taking soft wood cuttings. 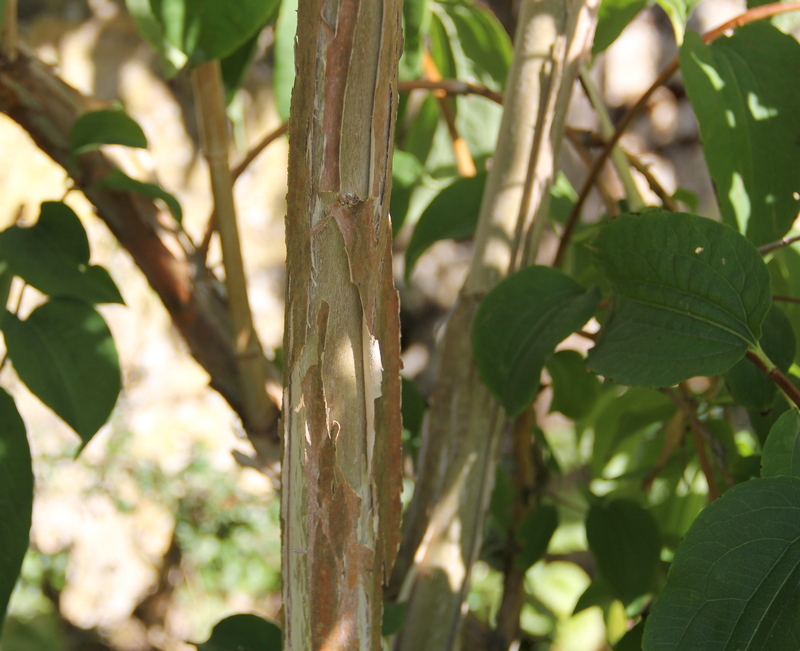 I have noticed that this spring the bark has started peeling. I at first thought something horrible was happening so I rushed to check it out on the internet and I was relieved to find that this is normal. I do like trees with peeling bark so this has proved a bonus for me but this will be the first winter that I will be able to appreciate as it has never peeled up until now. I am fascinated by the attraction this tree has for the bumble bees. 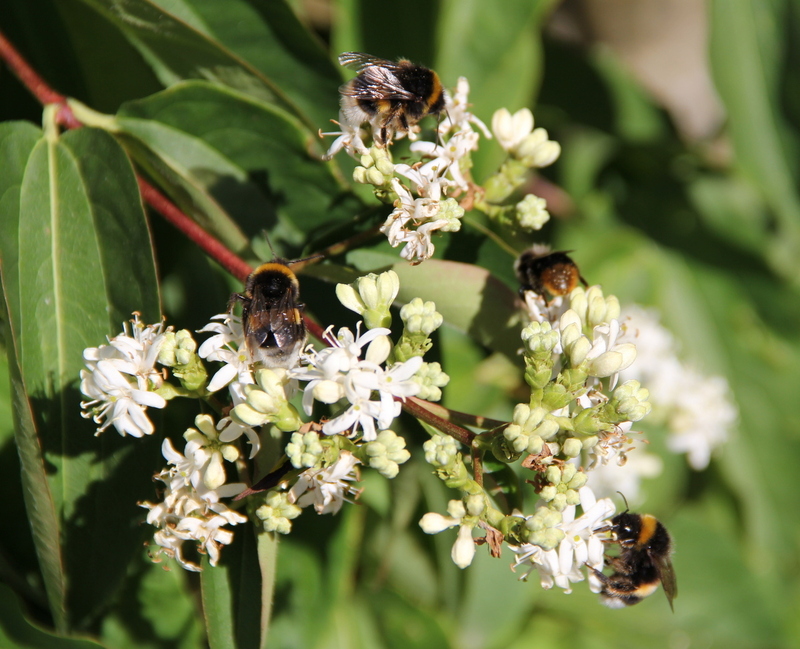 I’ve taken short video which lasts just over one minute http://youtu.be/wLRGrAlgeuY and gives a bit of an idea about the tree and maybe will convince you that Heptacodium jasminoides should be called “The Bumble Bee Tree”. 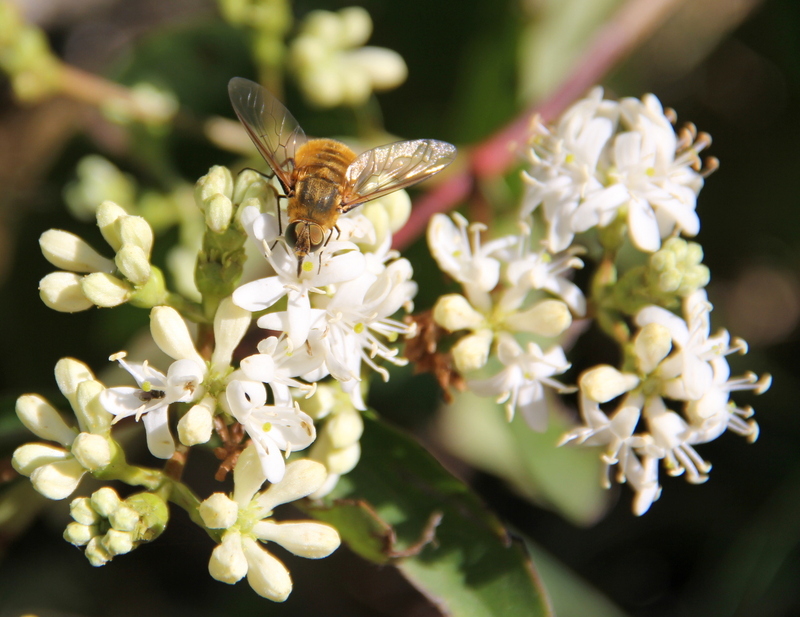 Categories: Garden | Tags: bees, bumble bees, flowers, garden, gardening, Heptacodium jasminoides | Permalink. It would be a coincidence! I am not certain as the flowers look more bell shaped and I cannot see any buds and they are very distinctive. Probably – perhaps proboscis length may be a factor, the depth of these flowers might suit the white-tailed bumble bees’ tongues perfectly. White-tailed bumble bees have short tongues compared to other bumbles. Lovely photos! I did consider that myself as they go straight into the flower and do not “steal” the nectar but I cannot see why that would put off the others. 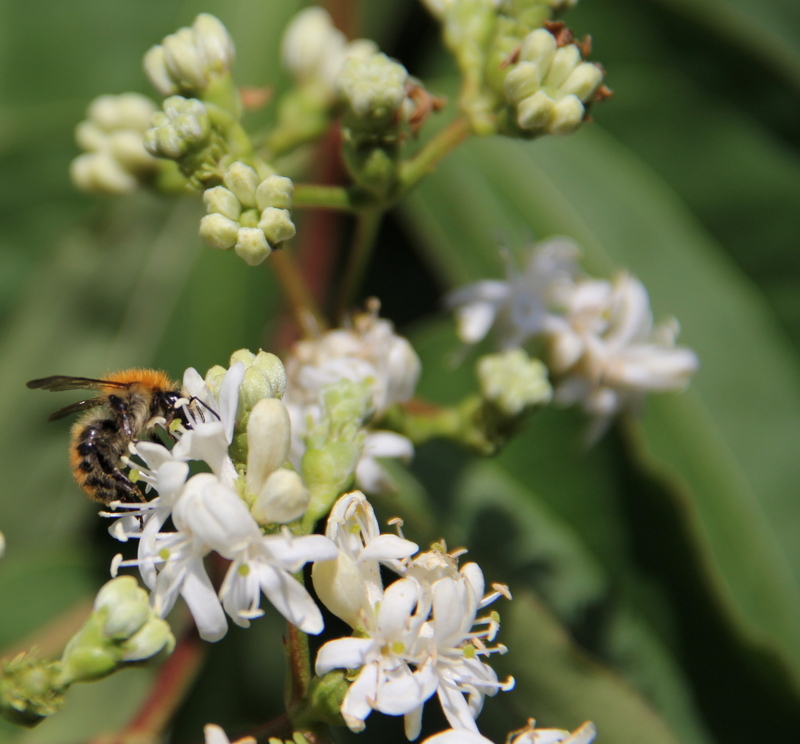 Hmm – maybe the longer tongued bees have a wider choice of flowers they can access, so the ‘Bumble Bee Tree’ may not be their first choice if they can reach flowers which offer a higher sugar nectar. Yes, that would work or maybe they are better forager/finders for new sources of nectar. Wish we could interview one. What a great variety of bees it attracts! By the way, that looks like a syrphid fly in the second photo. Thanks for the ID, I’ll keep a look out for it again. Super shots. And what an interesting plant. As it is such a hit with the bees, I may have to hunt one down for my own garden. We have limestone too. Perhaps it would grow in our garden. Does it take much looking after (this is a big factor for me). My general attitude to gardening is one of benign neglect I’m afraid. But anything which attracts large numbers of insects is desirable. My attitude is minimum care is a must for the garden. However, I do have to water it but not excessively, although all trees and shrubs will need more water in their first two years before the roots are established. No shortage of water here! The garden does get looked after, after a fashion. The previous owners set it out beautifully. We just struggle to find the time to keep on top of things – particularly the fiendish bindweed. You should have no problem then as I’ve done nothing to it since I planted it apart from some watering in the hot, dry summer. At least the bumble bees must appreciate your bindweed.